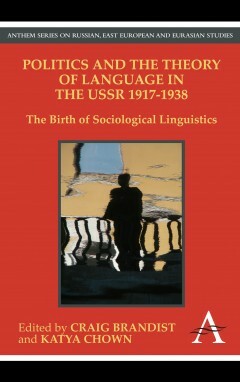 'Politics and the Theory of Language in the USSR 1917-1938' provides ground-breaking research into the relationship between linguistic theory and politics during the first two decades of the USSR. 'Politics and the Theory of Language in the USSR 1917-1938' provides ground-breaking research into the complex interrelations of linguistic theory and politics during the first two decades of the USSR. The work examines how the new Revolutionary regime promoted linguistic research that scrutinised the relationship between language, social structure, national identity and ideological factors as part of an attempt to democratize the public sphere. It also looks at the demise of the sociological paradigm, as the isolation and bureaucratization of the state gradually shifted the focus of research. Through this account, the collection formally acknowledges the achievements of the Soviet linguists of the time, whose innovative approaches to the relationship between language and society predates the emergence of western sociolinguistics by several decades. These articles are the first articles written in English about these linguists, and will introduce an Anglophone audience to a range of materials hitherto unavailable. In addition to providing new articles, the volume also presents the first annotated translation of Ivan Meshchaninov's 1929 'Theses on Japhetidology', thereby providing insight into one of the most controversial strands within Soviet linguistic thought. Craig Brandist is Professor of Cultural Theory and Intellectual History and Director of the Bakhtin Centre at the University of Sheffield. Katya Chown is Lecturer in Russian at Leeds University and Honorary Research Fellow at the University of Sheffield.